Are you inspired to leave your 9-to-5 job and start flipping houses? Written by expert real estate fix-and-flipper J Scott, this revised edition of the best-selling book details a step-by-step plan to succeed in your first—or next—house flip. Find a great investment, learn how to fix it up, and walk away with a profit. In this completely revised and updated edition, you’ll find new explanations on the ins-and-outs of flipping real estate in any part of the economic cycle, more options on how to finance your flips, and a focus on larger renovation projects not previously discussed! This no-fluff book contains a detailed flipping blueprint perfect for both the complete newbie or seasoned real estate pro looking to build a profitable house flipping business. 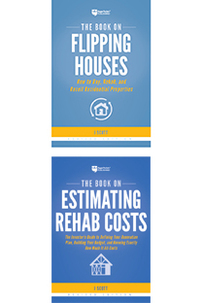 Whether you are preparing to walk through your very first rehab project or you’re an experienced home flipper, this handbook will be your guide to identifying renovation projects, creating a scope of work, and staying on budget to ensure a timely profit!